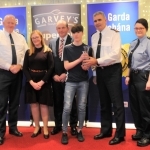 Garda Youth Awards 2018 Limerick took place at the Woodlands House Hotel in Adare. 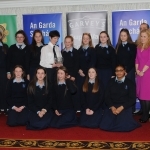 Leading young individuals and groups were recognised and awarded on the night. 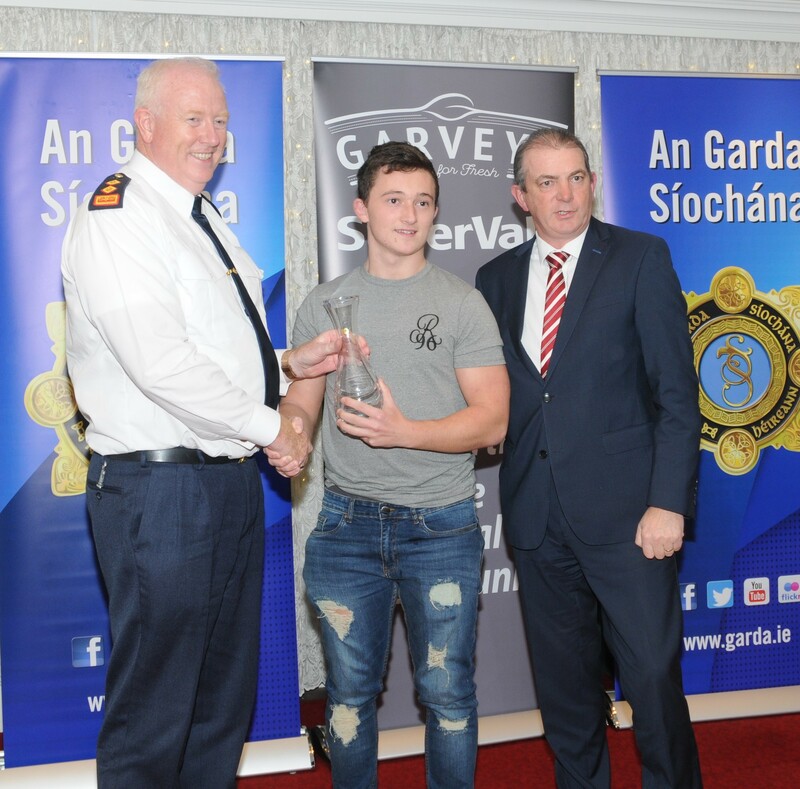 Pictured: Alan Wallace receives his award from Chief Superintendent Roche, Superintendent Deasy, Newcastle West and Mr. Kevin McCarthy Garveys Group. Picture: Seamus O’neill. 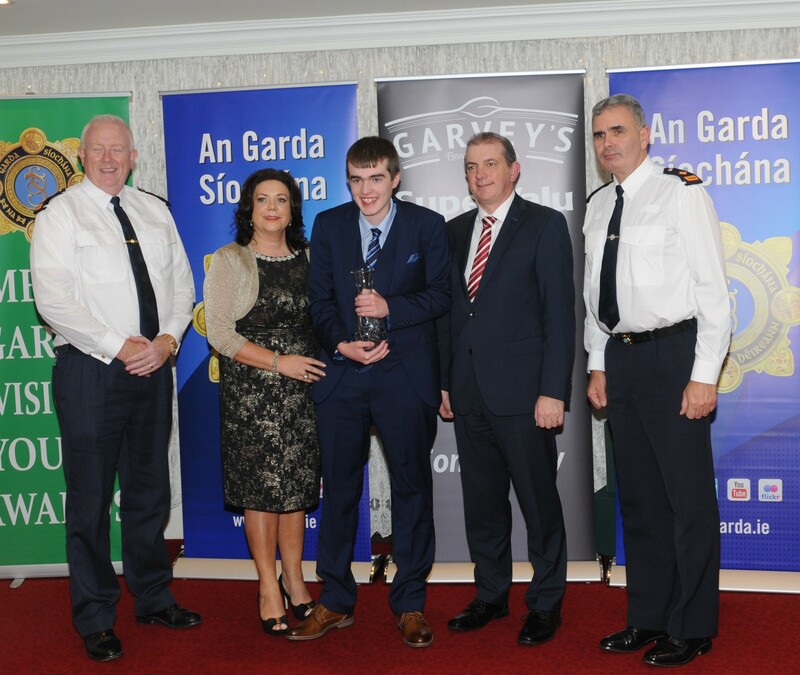 The 5th Annual Limerick Garda Youth awards took place at the Woodlands House Hotel in Adare on Thursday 29th November. 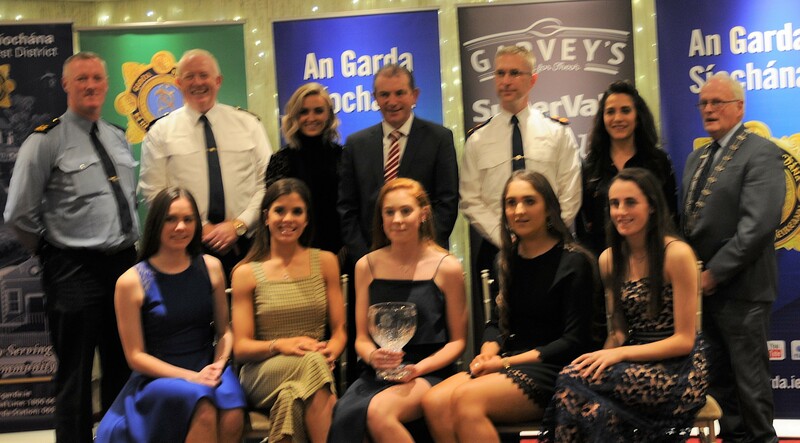 Chief Superintendent Gerard Roche of the Limerick Garda Division hosted a gala dinner for the 2018 winners. Master of ceremonies for the night was Mr. Seamus Hennessey while the entertainment was provided by the excellent pupils from the Corpus Christi primary school in Moyross and Garda Leanne McCarthy. 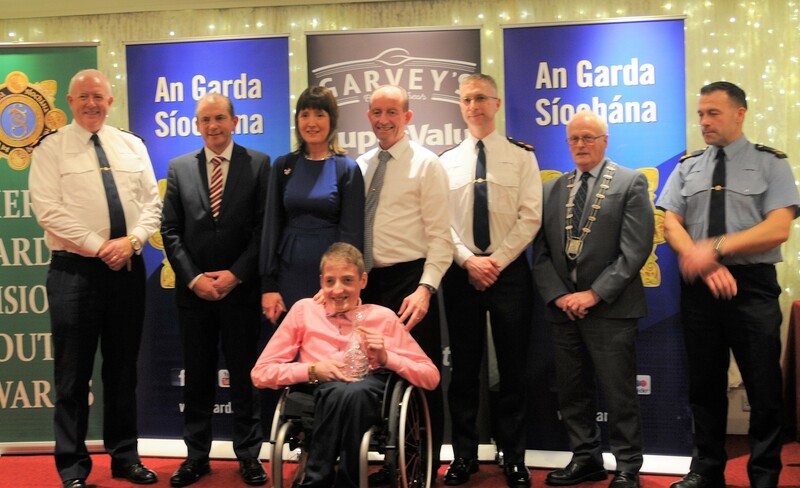 Attending the Garda Youth Awards 2018 were Deputy Mayor Cllr Eddie Ryan and Mr. Kevin McCarthy MD of Garveys Group who were the main sponsors of the event. 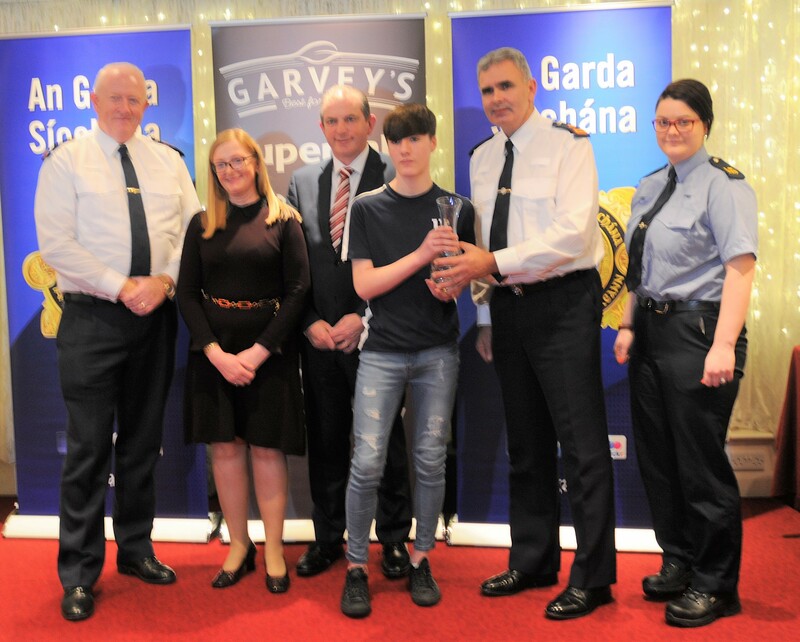 Speaking at the ceremony Chief Superintendent Roche stated that the night was in recognition of all the wonderful achievements of the young people receiving Garda Youth Awards 2018. They were a credit to their family, their community and themselves. Councillor Eddie Ryan, Deputy Mayor of Limerick congratulated all the winners and wished them well for the future. 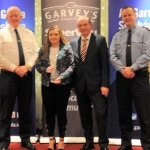 “It was great to see young people being recognised for all the work they do within the community and the challenges they have overcome,” Mr. Ryan said. 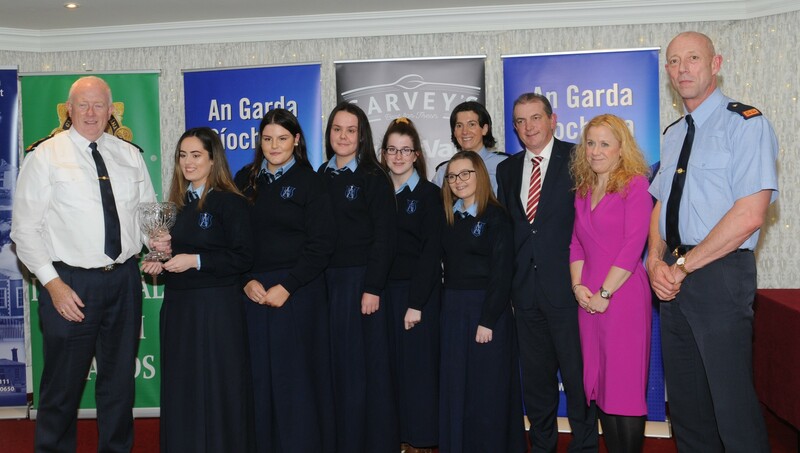 Mr. Kevin McCarthy of Garveys Group, too congratulated the winners and said that they were now role models that other people looked up to. 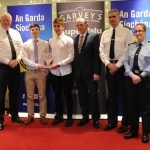 2018 saw five individuals and five groups receive Garda Youth Awards 2018. 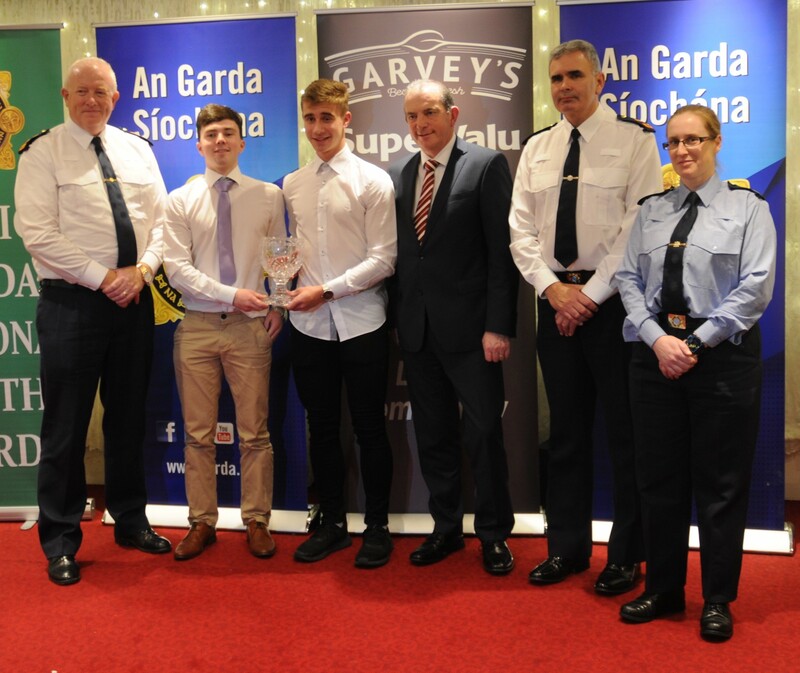 The five individuals who received the Garda Youth Awards 2018 were Craig O Brien, from St. Patrick’s Road , Alan Wallace from Coole West Athea Co. Limerick, Sean Byrne, a second year student at Scoil Na Tríonóide Naofa, Doon, with Ethan, a student at Desmond College, Newcastle West and Jade Purcell from Rosbrien in Limerick. 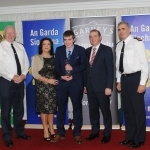 Craig O Brien from St. Patrick’s Road Limerick, a student at Limerick Institute of Technology has been involved in St Patrick’s youth club since he was 15 years old. After he joined, with the help of Limerick Youth Service he completed his junior leader training. When he turned eighteen, he achieved leader status and now recruits his college friends to volunteer for the club. He attends every meeting and runs a comprehensive programme for the young people of the area. Jade Purcell is from Rosbrien in Limerick and is currently studying to be a teacher at Mary Immaculate College. Throughout her life, she has involved herself in community work. 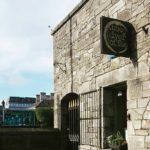 A talented musician, who has competed her education at Limerick and Munster Fleah Ceoils, she has used her talents to help others to access the joy of music. 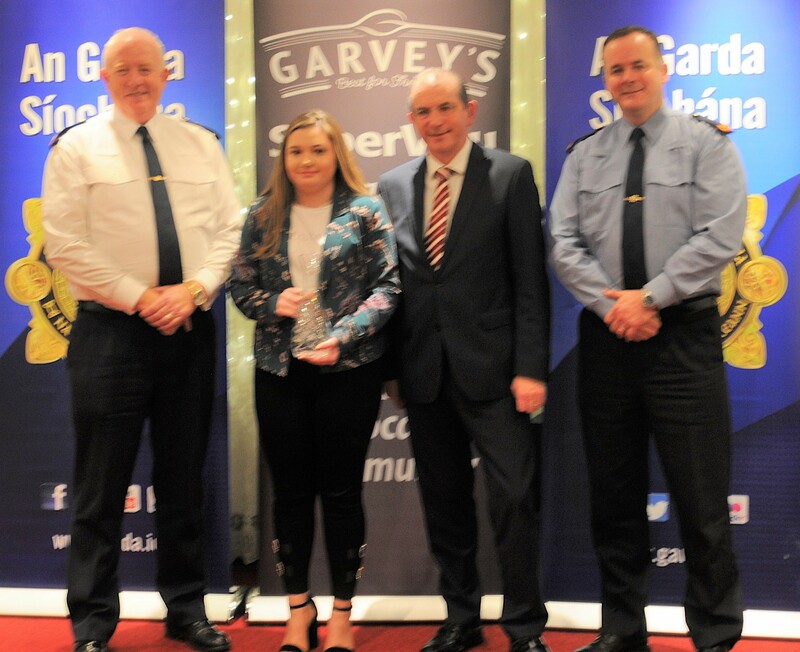 She volunteers at the local West End youth club, at St. Vincents Lisnagry and has helped to create links between MIC and her parish through the local SVP society. Alan from Coole West Athea Co. 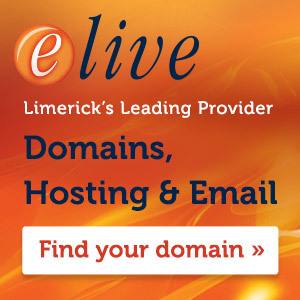 Limerick is 18 years old and is a student at Desmond College Newcastle West. His favourite subjects include maths, physical education, art and computers. He has overcome many obstacles since his diagnosis of ASD at age 6. He has progressed from communicating through a picture system to delivering a heartfelt farewell to the postmistress at Athea PO which closed in October. 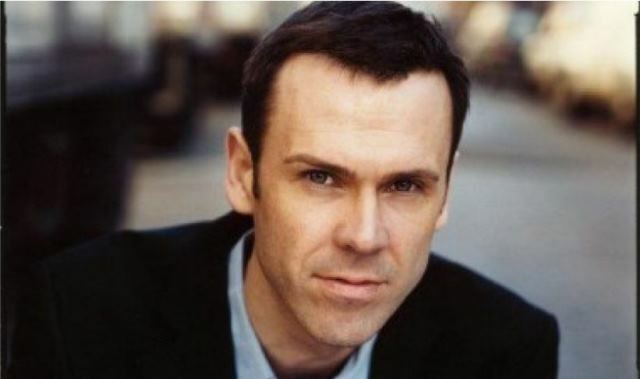 Alan’s many talents have seen him involved in promoting the Fair Trade initiative in Desmond College. 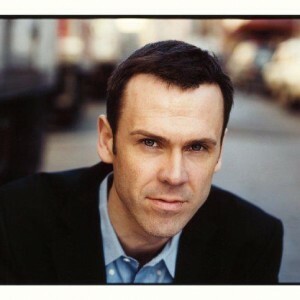 He has received many awards for his artistic creations which are admired and enjoyed by everyone. 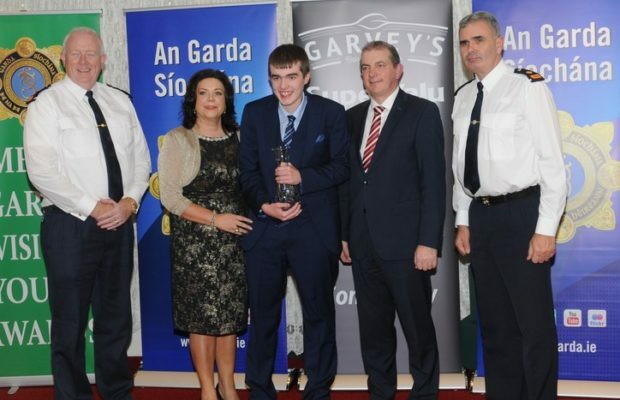 Sean Byrne is a second-year student at Scoil Na Tríonóide Naofa, Doon and is a native of Caherconreafy, Pallasgreen. Despite his medical condition, Sean’s achievements in his 14 years have been outstanding and inspiring. From learning to swim at the age six without the aid of an instructor to scuba diving in the sea two years later, Sean has never left his medical challenges to prevent him from achieving his goals. 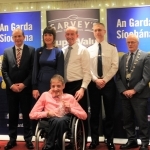 Together with his parents, Sean has been involved in setting up a junior wheelchair basketball team and has travelled all over Ireland taking part in events. Ethan is a student at Desmond College, Newcastle West. He is 14 years old and lives in Newcastle West. He provides regular and substantial care to a visually impaired friend each day. He is the guiding light for Ruben. He meets greets and guides Ruben to school every morning. He collects Ruben at his home to school and gently guides him to school mentioning any potential hazards that may lie ahead. 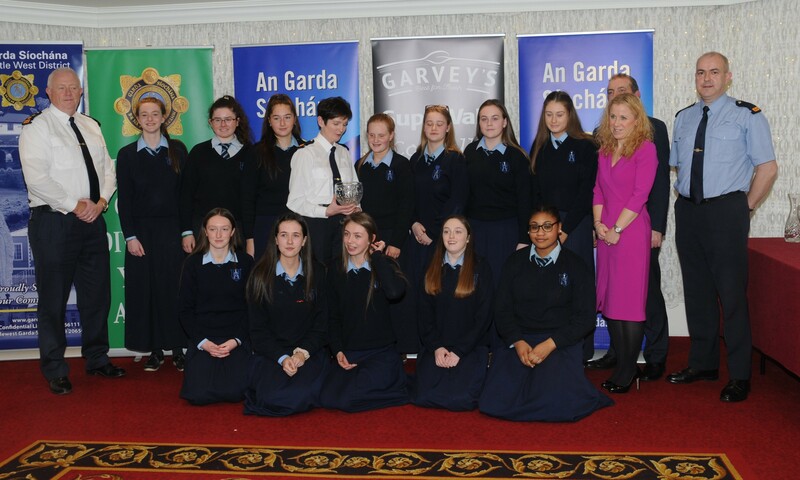 For their YSI project the TY1 students 17/18 of Ardscoil Mhuire, Corbally decided to tackle the issue of Sexting and the issues that can arise from it. Entitled ‘Sexting, Get the message # keepitpg’, they pitched their idea to the YSI Den and having received generous funding they designed and produced a bookmark to highlight the legal implications of sexting for young people. In 2016 the students of TYI 16/17 created a formula, The S test, to help young adolescents to make sexually responsible decisions by asking themselves four simple questions, Am I 17? Am I sober? Am I safe? Am I sure? The students designed a glow in the dark wristband with the keywords written on it with the intention to give young adolescents a reminder of the importance of making sexually responsible decisions. 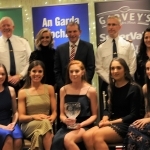 In May 2017, Maeve Barry, Eva Butler, Anna Rose Kennedy, Laura Morrissey and Eadaoin Power Gallagher together with teachers Caoimh Ryan and Suzanne Mortell undertook a journey of learning to Zambia with the Alan Kerins project. The aim was to make a significant impact on the areas they would visit and to empower communities to shape their future. 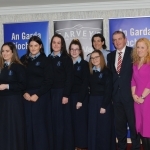 Having recruited the help of families, teachers and the local community they raised in excess of €46,000 over 7 months. 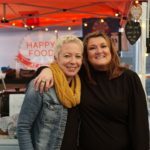 This fundraising created a platform that unveiled the true value and meaning of community. 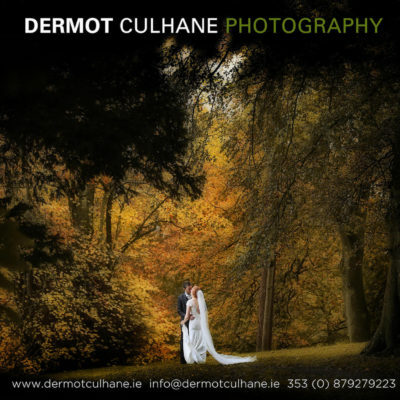 Thomas Curtin from Newcastle West and Dylan Moloney, Ardagh and are students at Desmond College, Newcastle West. 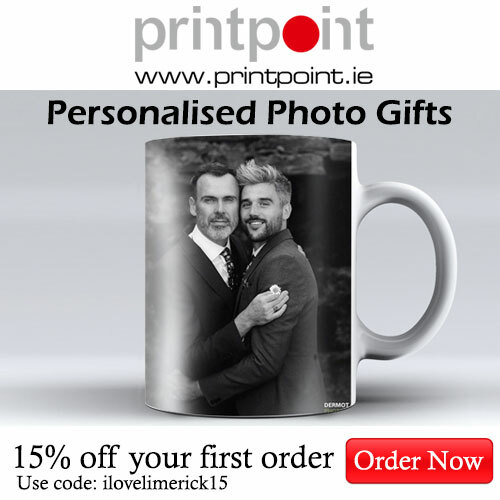 They are 17 years old, both Dylan and Thomas were members of a very successful student enterprise team that have won several national and international awards. The boys invented a height adjustable crutch which allows users to sit down or get to a standing position with ease. This device will be of significant benefit to those in their community needing such equipment. 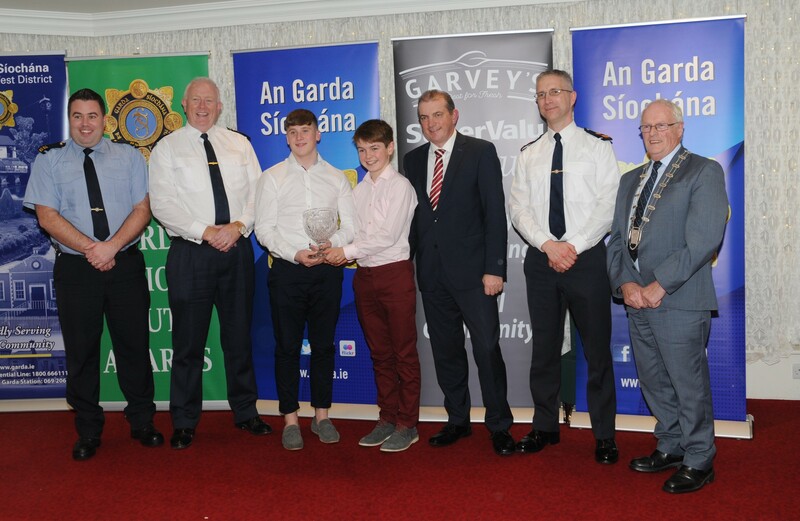 Scott from Bruff and David from Athlacca, both 16 years old, were out cycling in the Ballyhoura mountains when they came to the rescue of an injured cyclist. They had taken two different routes on the mountain when Scott came upon a man covered in blood in a semi-conscious state. Having checked to see how he was he warned him not to move and then went to get his friend David to help him. With the help of David’s father who was nearby, they assisted the man and waited for the ambulance. The man, Pawel Glowczyk who is originally from Poland spent four weeks in the hospital with a head injury. 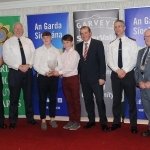 The awards are designed to acknowledge the volunteering activities of young people living within the Limerick Garda Division between the ages of 13 years and 21 years. They also acknowledge the endeavours of young people that have faced and overcome challenges in their life.